Nova Scotia will be welcoming 20 to 30 privately sponsored Syrian refugee families before Dec. 31. At a press conference Wednesday, Gerry Mills, director of operations at Immigrant Services Association of Nova Scotia (ISANS), announced that the timing of the arrivals is still unclear. Provincial Immigration Minister Lena Metlege Diab announced that her government will continue to work with organizations and volunteers as plans for welcoming the refugees are developed. “We’ve been preparing for months because we really want to welcome them and treat new Nova Scotians…as we would want to be treated ourselves, with lots of hope, lots of love, and lots of courtesy,” Diab told reporters. “We now know that  received 917 calls from Nova Scotians offering assistance, and many people are offering more than one type of assistance,” Diab said. Mills asked for patience as the 211 helpline takes calls for refugee assistance. “Right now we are honestly overwhelmed [by the response] and we shouldn’t have been because this is what Nova Scotians do,” Mills said. She said that there is a particular need for Arabic speakers and volunteers. The specific needs of each family will be identified as they arrive. According to Mills, financial donations accepted through 211 will go directly to refugees. Gerry Mills said that about 60 sponsoring groups, mostly churches, are scattered around Nova Scotia. About half of them are in Halifax. She also said that ISANS is trying to connect Canadian Syrians with a sponsoring group. “We’re trying to reunite families,” Mills explained. According to Diab, refugees who are privately sponsored will go to their host community. This means incoming refugees will be welcomed all over the province. Diab took several questions about the federal government’s policy to prioritize families, women, and children. “I’ve lived through war myself,” Diab said with tears in her eyes. “The hope is, and I believe most statistics show, that within the first year most people will get on their feet. People don’t want to come here…and be looking for government help. Most people will be coming here and be grateful to be here and to support themselves and their families,” Diab said. The province will be looking into providing education for refugee children whose first language is not English. 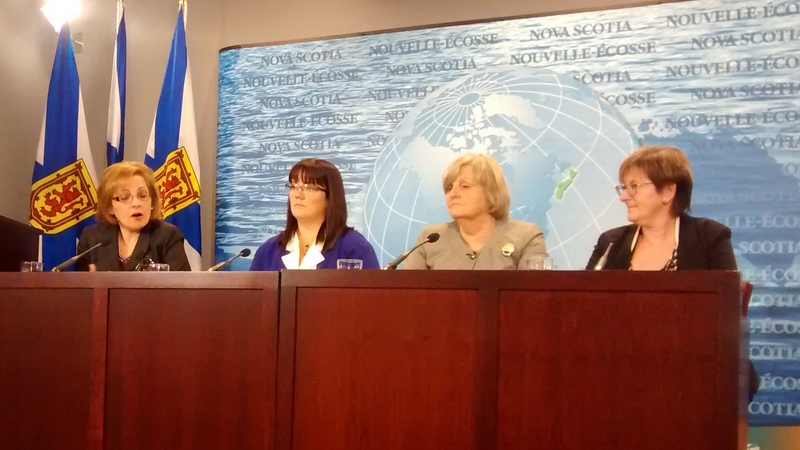 Minister Diab said the government hopes to retain the refugees who arrive in Nova Scotia. “It’s important that they don’t go from province to province to province,” she said in French.